ID: Relatively smooth shell with ridges which span the shell. White/gray-blue shell. 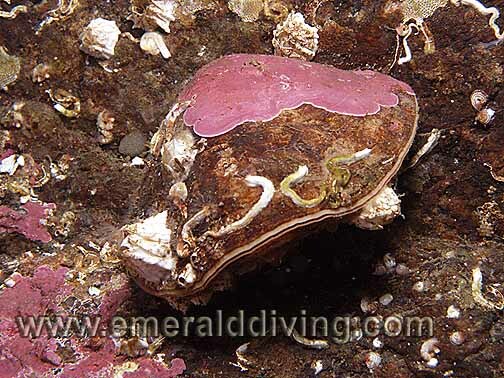 Comments: I only occasionally note the butter clam sitting in the open on soft substrates. Empty butter clam shells often litter the bottom and are all that is left of this creature after a sunlower star digs it up. ID: Thin, rounded shell often encrusted with invertebrates. Comments: I often overlook these very abundant , well camouflaged, and low profile bi-valves. 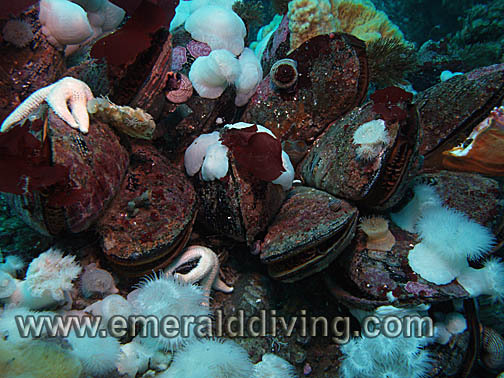 There are probably various species of lampshells in Northwest waters. I readily find these species attached to any solid structure in reef areas. Typical size: 2� diameter siphon. ID: Large siphon with brown and white markings. Comments: An extended siphon is all I every see of the piddock clam. 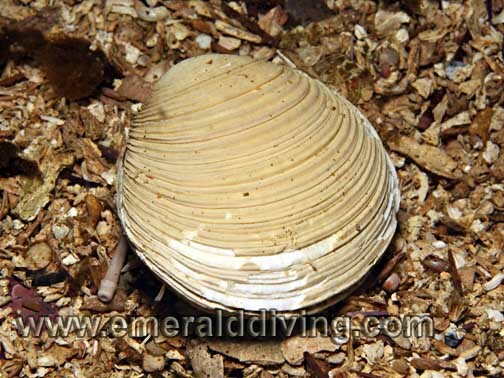 This species is very common throughout Northwest waters around clay walls or soft substrates. Some of the clay walls around Point Defiance have so many holes drilled by piddock clams that the wall looks like Swiss cheese. 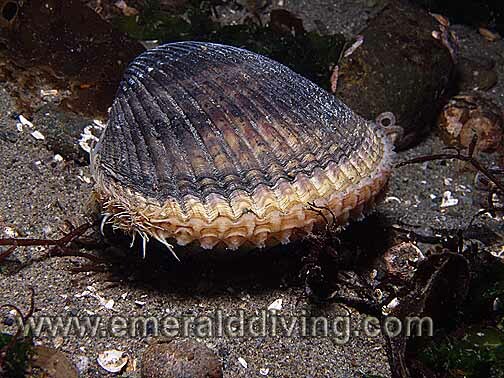 ID: Distinctive round scallop shape. Usually encrusted with sponges. Mantle coloration can vary greatly and usually marked with dark thick bands. 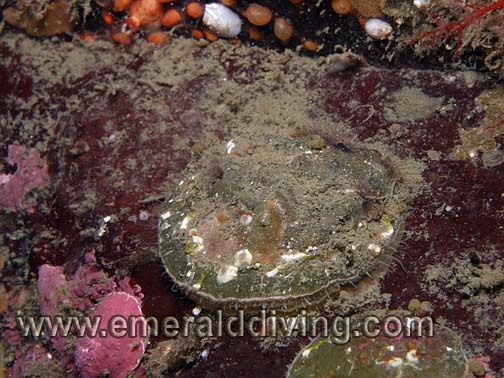 ID: Very large scallop - usually well camouflaged with heavy growth. Thick, rounded shell with orange mantel and tiny blue eyes. 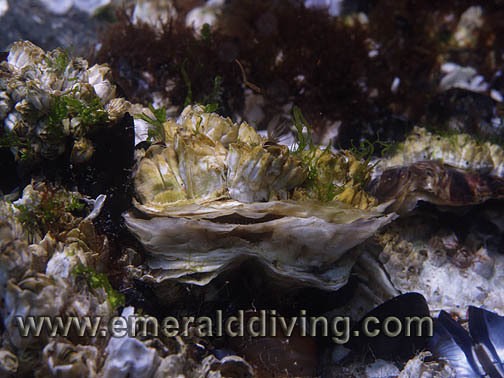 Comments: I commonly note the rock scallop in rocky area in the San Juan Islands and Cape Flattery area. 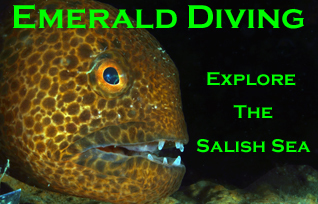 I occasionally see the odd specimen in Puget Sound and Hood Canal as well. 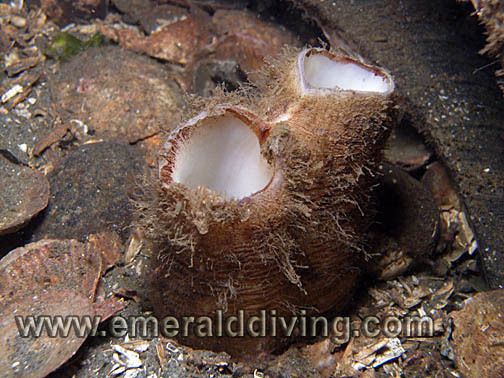 Rock scallops are the largest scallops divers encounter in the Northwest and can grow to near the size of dinner plates. Their shell is often encrusted with growth. ID: Color is typically blue or black, but can be tan or brown. Comments: These mussels grow huge in the Cape Flattery area, where this photo was taken. Incredible colonies of mussels are found at Duncan Rock. ID: White elongated, layered shell. Irregular shape. Often encrusted with barnacles. 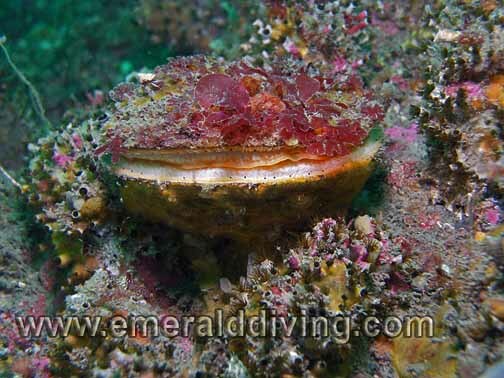 Comments: I rarely note oysters when diving as they prefer very shallow rocky areas. When I do find them, this is typically what they look like - a foundation for barnacle colonies. Photo taken at Pulali Wall in Hood Canal in three feet of water. 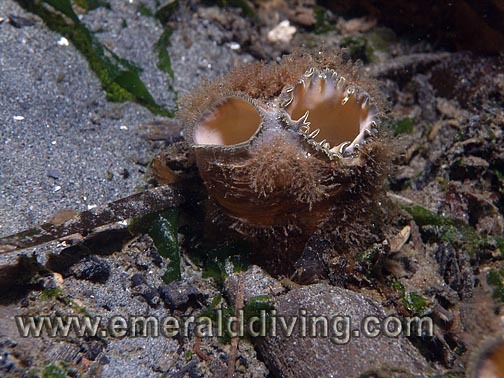 ID: Large extruding siphon with fleshy grey "teeth" encircle one port and a delicate fringe encircles the other. Comments: My very sources have lead me to conclude this this siphon is owned by a large clam called a fat gaper. However, there is no way to tell for certain without digging the poor animal up. These clams are common throughout sandy areas. Photograph take at KVI Tower Reef in central Puget Sound. ID: Attaches to rocks. Very thin profile, of encrusted with other invertebrate. Comments: Green false-jingles are very inconspicuous but often colonies vast areas of rock. They actually have a hole on the bottom part of their shell through which they attach themselves permanently to solid structure. They usually don't open more than a few millimeter, as pictured here. Photographed at Peapod Rock in Rosario Strait. ID: Large siphon with white interior. No "teeth" on either siphon outlet. Both outlets similar. Comments: I believe this siphon belongs to the famous Geoduck. This animals siphone can extend for several feet through the soft substrate. This calm can live for over 150 years. This is another common inhabitant of sob substrates throughout Washington waters. Photographed at Three Tree Point. ID: Series of distinctive concentric ridges completely across the shell, often with sections that look "chipped away". Shell color includes is white or off-white. Comments: I have only noted this clam in the Port Hardy area. 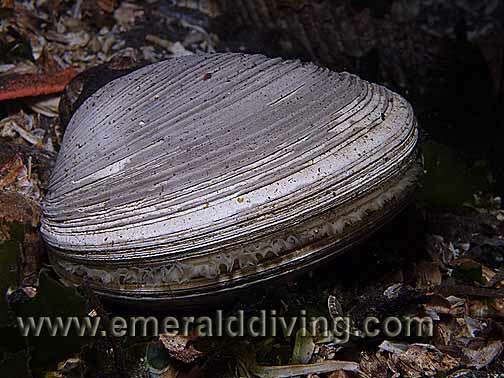 The fact that this clam has distinctive concentric ridges and will actually sit above the substrate make it fairly easy to identify. ID: Series of vertical and almost parallel grooves span shell. Shell color includes blues, grays and browns. Comments: I occasionally note the rugged looking heart cockle when diving soft substrates. 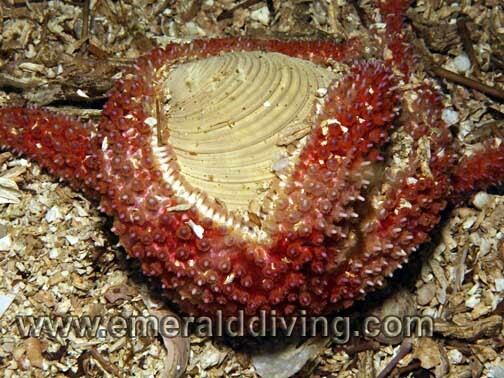 When the heart cockle comes in contact with the predatory sunflower star, it will use its long muscular foot to jettison itself away from the seastar to safety. 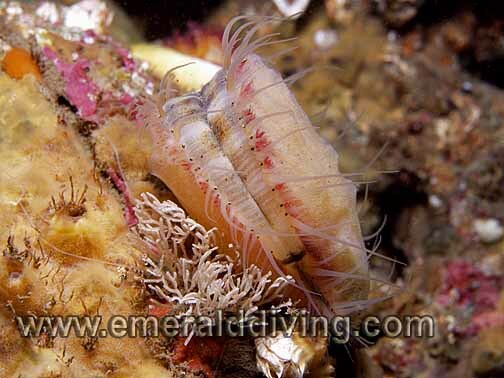 Comments: A Kennerly venus clam shows why it is not afraid to show its shell above the substrate. This species is notoriously strong and can easily thwart the attack of this painted star which is trying to pull it apart. 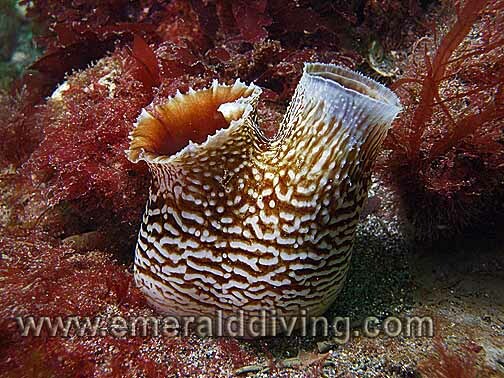 This venus clam is so strong, it can reported even defeat the powerful sunlfower seastar attack.